Updates on Bagyong Lando, categorized as a typhoon by the state weather bureau PAGASA, as of Saturday, October 17, are posted on this page. At 4 p.m. today, the typhoon's center was spotted at 230 kilometers East of Baler, Aurora with maximum sustained winds of 175 kilometers per hour near the center and gustiness of up to 210 kph. It is moving West at 10 kph. Houses of medium strength materials (old, timber or mixed timber-CHB structures, usually with G.I. roofing's); some warehouses or bodega-type structures are unroofed. Very light or no damage to high risk structures. Light damage to medium to low risk structures. Slight damage to some houses of very light materials or makeshift structures in exposed communities. Some banana plants are tilted, a few downed and leaves are generally damaged. Estimated rainfall amount is from heavy to intense within the 650 km diameter of the typhoon. Occasional rains and gusty winds will be experienced over provinces under PSWS #1 while those under PSWS #2, #3 and #4 will have stormy weather. 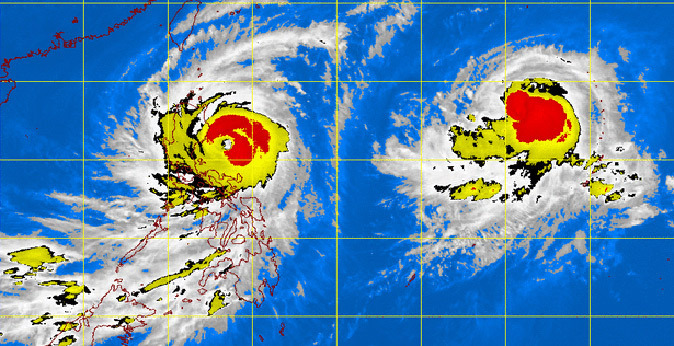 Typhoon Lando is expected to make a landfall over Aurora area by Sunday morning. Storm surge may reach to a maximum of 3 meters in Aurora and neighboring provinces. Wave height in open sea may reach up to 14 meters or higher. State forecasters said stormy weather is expected over Metro Manila, Ilocos region, Cagayan Valley, Cordillera, Central Luzon and the provinces of Camarines Norte, Rizal and Quezon including Polillo Islands. Rains with gusty winds will prevail over the rest of Calabarzon and of Bicol region and the province of Marinduque, Northern part of Mindoro including Lubang Island. Cloudy skies with light to moderate rains will be experienced over Visayas, Zamboanga peninsula and the rest of Luzon. Partly cloudy to cloudy skies with isolated thunderstorms will prevail over the rest of Mindanao, the weather agency posted. Moderate to strong winds blowing from the northeast to northwest will prevail over Visayas and the rest of Luzon and coming from the southwest over Mindanao with moderate to rough seas, PAGASA added.